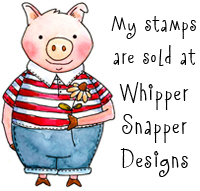 Welcome to Day 3 of 3, of the Impression Obsession Fall/Winter Die Blog Hop! I created a card for today, using Halloween Scene DIE588-Y. We have some beautiful new dies to share and four Impression Obsession Gift Certificates to give away! The Blog Hop will be posted on the Impression Obsession Blog at 6am EST each day, Monday September 11th through Wednesday September 13th. 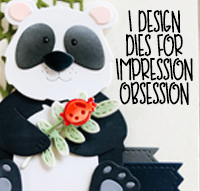 Visit the participating IO Design Team’s blogs (only one comment per blog per day please) for a chance to win one of the $25 Impression Obsession Gift Certificates! 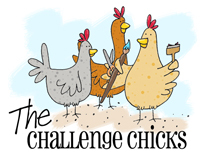 The more blogs you visit, the better chance you will have to win. Comment entries for all of the hop days will be open until 9pm CT on September 17th and all winners will be announced Monday September 18th on the Impression Obsession Blog. Good luck! All of the new dies you'll be seeing in the hop are available for purchase today! Visit Impression Obsession for a complete list of new products. Now, here's some inspiration for you! Weeee! Spooktacular card! The background really makes the die pop. Great Halloween Scene! awesome card! Love the gradient ink blending you did in the aperture! I also like how the black paper looks textured, almost corrugated. Nice touch to an otherwise CAS card. Great card, I am really loving these intricate halloween dies! :) Thanks for sharing. Such a pretty card...great die. What a great die! Love the scene and how easy it is to create a card with this! If I could only have dies from one company, it would be IO. If I could only have one Halloween die, this would be it! Great card, I'm sold!!! You make it look so simple! Love the orange glow behind that fantastic die cut image! Dramatic and effective. Hi, love the new die Halloween Scene. Will have to get it for my sister is so into Halloween! This a such a great die!!! Love all the new Halloween dies from IO!!! Your background is done so perfectly ... I imagine you've made some amazing sunset card! You've really put me in the Halloween spirit! I love all these new Halloween dies where you can use them as is for a real quick intricate card or cut some of the pieces off and use them on other cards and get more use out of the dies. The brightness you've achieved on your card gives it a Halloween glow. It's so pretty! i love this card! halloween is my favorite season! i need this die. Great Halloween card! That die is perfect! Your background behind it creates a perfect halloween sky! The black textured paper and the orange and white twine w/button give your card a great "pop!" That is the perfect Halloween card. The background coloring is wonderful. What an awesome card! Love the spooky look! Your background makes a great showing for the really clever die. I love this card. Very nice. Great detail on this die and you gave the paper such contrast Wowza! so spooky . . .
Oooh, that background just glows and really shows off the Halloween scene! Wonderful ink blending & that button is a perfect match! Great card and die, perfect color! Love all the detail with this fun Halloween Scene die! Awesome card! Oooh, spooky! Love the bright background. Love the background, Anna! It's so perfect for the diecut scene.